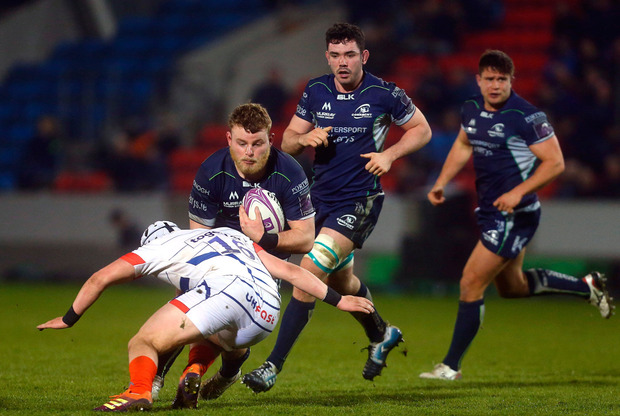 Connacht prop Finlay Bealham’s hand injury is not as serious as first feared and the Irish international looks set to play a part in the province’s Guinness PRO14 run-in. The Australian-born tighthead suffered the wound in the closing stages of last night’s 20-10 defeat to Sale Sharks in the Challenge Cup quarter-final. He was in visible distress as he received treatment on the field and was taken to hospital after the game, but this morning he provided a positive update on his condition on social media. “Tough night,” he wrote on his Instagram page. “Gutted to come off in the manner I did but I’m blown away by all the support I received from everyone. Thank you. Jack Carty is another worry for the western province who have a number of injuries at out-half going into the business end of the season. The Ireland international was forced off with a bicep injury. Third in Conference A of the PRO14, Connacht are ahead of Cardiff Blues on points difference. They face Zebre away next weekend before welcoming the men from the Welsh capital to the Sportsground on Saturday week. They finish their campaign away to Munster as they look to earn a play-off spot and automatic qualification for next season’s Champions Cup. “We’ve got three left there,” coach Andy Friend said of the run-in. “Zebre next weekend is a huge one for us away from home, so we need to regroup after this loss and make sure we get to Parma with a team that can win. “We’re all disappointed with that (loss to Sale) but I know there were some positives out of that. “Our fight, we didn’t give up. We are a team that’s building and growing. “Sometimes you’ve got to take losses, it can’t always be forward momentum. You get knocked, you’ve got to make sure you learn from that and step up. “That’s happened to us throughout this year. We had that disappointing loss to Glasgow and the next week we played one of our better games of football, so there’s resilience within the team, which is good.